J.B. Christopher can’t sit still for long but when he does, he writes fiction on violence, lust, deceit, and perdition. His short fiction has appeared in various publications over the years. 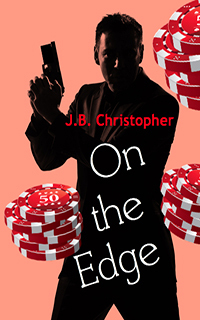 On the Edge, his debut novel, was originally released by Rainstorm Press. Ruben Oliveras is a decorated detective who has spent the last fifteen years working tirelessly for the Reno Police Department. A lone wolf who has spent his career doing things his way, his dedication to the badge and his career leave little time for much else in his life. Jack Murray is a casino owner used to living the high life and is a target of a bombing extortion plot, and Oliveras is tasked with the case. The extortionists demand three million dollars or they will destroy the Royale. Oliveras and his new partner discover the culprits of the bomb plot and in the investigation uncover a secret gambling club with illegal prostitution, drugs, and a client list of Reno’s wealthiest citizens. When Ruby discovers the patrons of the penthouse club include the Mayor and other city and state politicians, he is quickly urged to close the bombing case by his superiors. When a close informant to Ruby is brutally murdered, Ruby begins to understand the seriousness of his situation and fears for his life.